Snowmobilers must follow rules and regulations, the same as any other motorized vehicle. 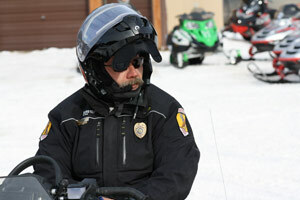 Laws are in place to help ensure the safety of you and others, as well as to help safeguard the image of snowmobiling. NOTE: The general information presented in this section does not take the place of the laws set by the state or province you register and/or are going to ride your snowmobile in. Make certain you thoroughly understand the laws of the riding area you're in before you begin. Registering your snowmobile where you live is required by law in nearly every state and province. This registration is required in order to operate your snowmobile on trails and areas open to public snowmobiling. In most cases your registration fee is deposited into the state's/province's snowmobile program and used to provide trails and riding areas. You typically receive a certificate and adhesive decal(s) once you pay your fees. The registration certificate should be carried on the snowmobile and the decal(s) must be affixed to the snowmobile as directed by information supplied with the certificate. 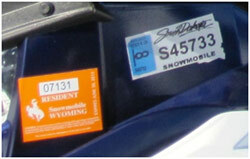 If registration decals are not attached to the snowmobile, you are subject to being stopped by law enforcement. Some states and provinces require snowmobiles to also have a trail pass or pay a trail user fee, in addition to purchasing the resident annual registration. Additionally, snowmobilers who travel to other states or provinces are often required to purchase a trail pass or pay a non-resident user fee to help fund the trails and riding areas they use. This is typically another decal which must be affixed to the snowmobile. Always check the local registration and trail pass/user fee requirements before riding in your home area and other areas you visit. Slow down as you approach the road crossing to ensure you can safely stop at the road and not slide into oncoming traffic. Be sure to come to a complete stop and look both directions at least once before crossing. When coming upon the road, change your riding position from sitting to standing. Stand tall on the running boards to see and to be seen; this will help you better see oncoming traffic as well as help approaching motorists see you. Automobiles have the right-of-way on the road, so wait for all traffic to clear before starting your crossing. Avoid stopping with your skis on pavement and the track on adjoining snow or ice since this often results in not having enough traction to get the snowmobile moving once it has stopped. If this happens, be extremely cautious of approaching traffic when trying to get the snowmobile moving again. Cross directly or as straight as you possibly can across the road crossing. Remember that concrete and pavement do not allow for good steering control so the sled must be pointed in the right direction for the crossing before you start across the roadway. Cross slowly and carefully; do not cross any road at high speeds. When encountering roads along the trail or in the area you're riding, be aware of which roads you can or cannot legally ride upon. Laws prohibiting snowmobile operation on certain roadways were established for your safety and the safety of automobile drivers. Always check local laws for the jurisdiction where you'll be riding since local rules regarding snowmobile operation upon roads can vary significantly from one area to the next. The following represents only a few of the regulations common to snowmobiling in most jurisdictions. Consult regulations in the state or province where you snowmobile to learn the full range and specific requirements where you ridebefore you ride. The minimum age to operate a snowmobile can vary by state or province. For many it is 15 or 16, as young as 12, or as old as 18. Be sure to check your local laws, or the area you plan to ride. Some states and provinces may also require that you pass a safety certification course to operate a snowmobile. Again, check the area where you will be snowmobiling in to be sure of age restrictions and safety certification requirements. Exhaust systems that have been modified and are louder than factory exhausts are often illegal. Many states, provinces, and public land agencies prohibit the operation of excessively loud machines and restrict sound levels to a certain decibel limit. These violations can carry substantial fines so be certain to check sound laws where you ride. Along with being illegal, riders who modify their exhausts must understand that excessive snowmobile noise is a leading reason why trails and riding areas are closed by private landowners and public land managers. Even though you may think that extra sound is "cool" and thrilling or equates to more power, it is actually one of the greatest threats to future snowmobiling access. More sound means less access, so do your part to help keep trails and backcountry riding areas open. Always obey all posted speed limits. Some areas may also have speed restrictions for when riding in proximity to pedestrians, homes, ice fishermen, other recreationists, etc. For example, some areas may require you to stay at least 100 feet from pedestrians which can include hikers, cross-country skiers, fishermen or even snowmobilers who have stepped off their machine, and to operate at a speed as low as 10 mph while in their vicinity. Another example is that some areas may require you to travel no faster than 10 mph when riding near a residence or between the times when their local curfews or noise ordinances are in effect. Since speed restrictions can vary widely and may not be posted, it is important to check local requirements and adhere to speed restrictions to ensure the safety of others, as well as to be a courteous rider. There are many places where snowmobiles may not be allowed to operate. These areas are generally, but not always, posted with signs indicating that snowmobiling is not allowed. 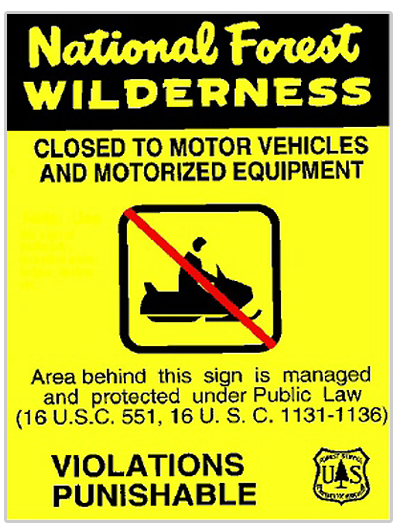 Examples of areas where snowmobiling is generally prohibited include: airports, railroad property, cemeteries, parks, golf courses, sacred Native American lands, school properties, designated Wilderness areas, designated wildlife winter range, and most private property. 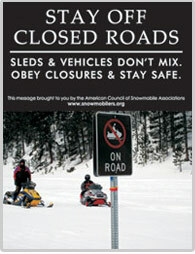 Check local regulations to ensure you understand which areas are closed to snowmobiling before riding. A law enforcement officer can stop you when you're riding a snowmobile in most jurisdictions if they believe they have probable cause. This can be for something as basic as checking your registration, trail pass or user fee compliance. It can be for violating posted regulations or speed limits. It can be for operating in closed areas or trespassing onto private property. Or it could be a trail checkpoint for alcohol or sound violations. If signaled to stop, do so immediately in a safe manner. Failure to stop, or eluding a police officer, can result in high fines and possible jail time. Drinking and driving laws pertain not only to automobiles, but also to snowmobiles. 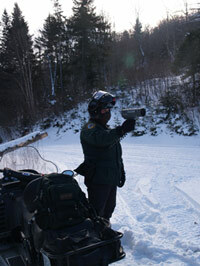 States and provinces have varying limits for alcohol consumption while operating a snowmobile that range from 0.08 or 0.1. In most jurisdictions snowmobile operators can be arrested and spend time in jail for an OWI or DUI arrest on their snowmobile. This violation can also result in having points assessed against your motor vehicle driving record in many states. OWI and DUI laws are not limited to only alcohol but also include the use of illegal drugs. Alcohol and drug use greatly impairs your sense of balance, coordination and judgment. 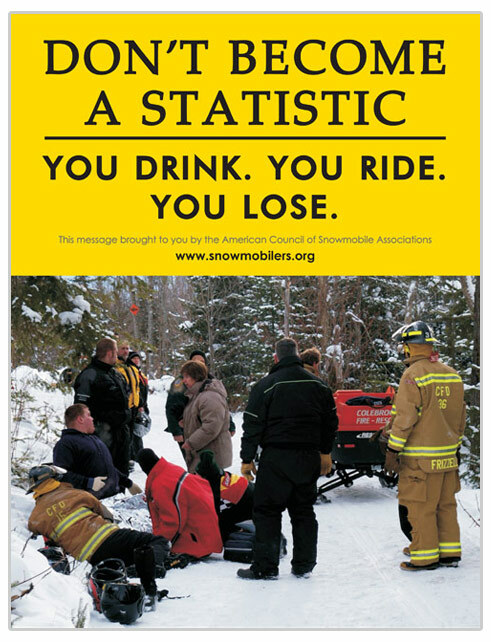 A significant number of snowmobile accidents are caused by alcohol use. DON'T DRINK AND RIDEavoid injuring or killing yourself or others. Stay on marked trails through private property and respect the fact that private property owners have given permission for snowmobile trails through their property. 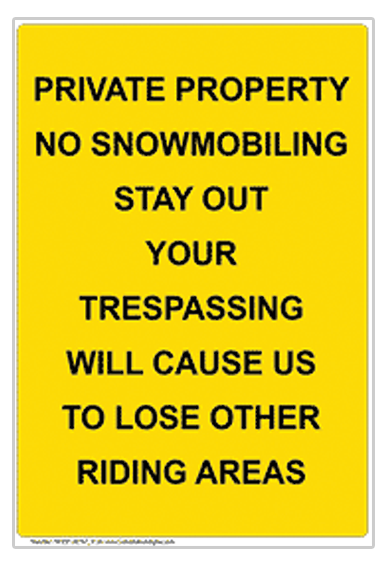 When riding off trails, understand that private property, including corporate lands, powerlines, pipelines, and railroad right-of-ways, are generally closed to snowmobiling without permission from the landowner and often do not have to be "posted" as closed. Trespass violations, even those that appear minor or are not always directly adjacent to marked trails, are one of the leading causes of trail closures through private property. Riders must understand that permission from private landowners for snowmobile trails typically applies to only snowmobile use during the winter. Therefore, snowmobile trails are often not open to ATVs, UTVs or other recreational uses at any time, and particularly not during the spring, summer and fall when landowners are using their properties for other activities. Do not follow snowmobile trails or maps during non-winter months falsely assuming they are open to other recreational usebecause they generally are not. Some portions of public lands are often closed to motorized vehicles including snowmobiles. This can include park lands, general nonmotorized zones, designated cross-country ski areas, and wildlife winter range or special deer yards. 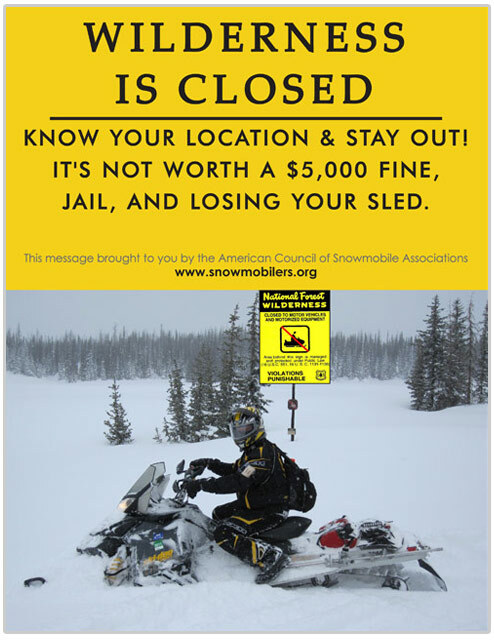 It is important that snowmobile riders respect these closures since trespassing is not only illegal but can damage the image of snowmobiling. Trespassing in these areas can ultimately result in the loss of future access to public lands, so be a respectful rider and stay out of areas. Congressionally designated Wilderness Areas on federal lands are closed to all mechanized use, which includes snowmobiles. It is the responsibility of riders to know where Wilderness boundaries are located and to stay out. 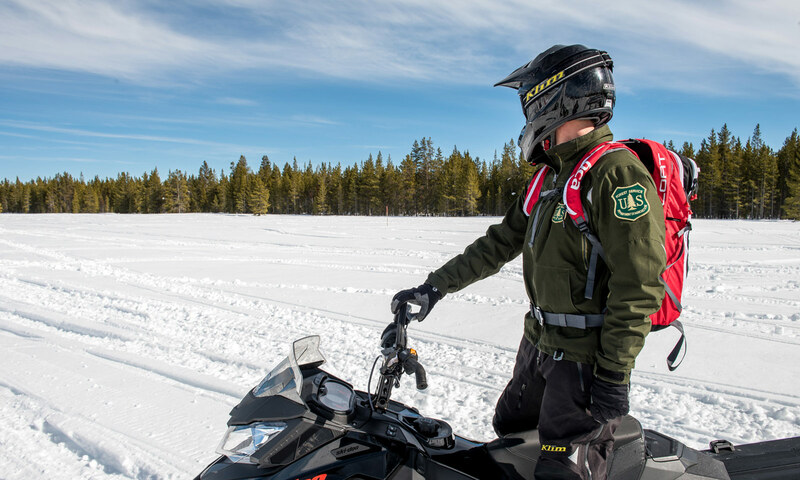 Wilderness trespass violations can result in substantial fines, jail time, and seizure of your snowmobile.